Thank you all who participated in our April Crop in support of Partner's in Mission Food Bank, we raised $95.00. Next month we are supporting Relay For Life - details can be found here. 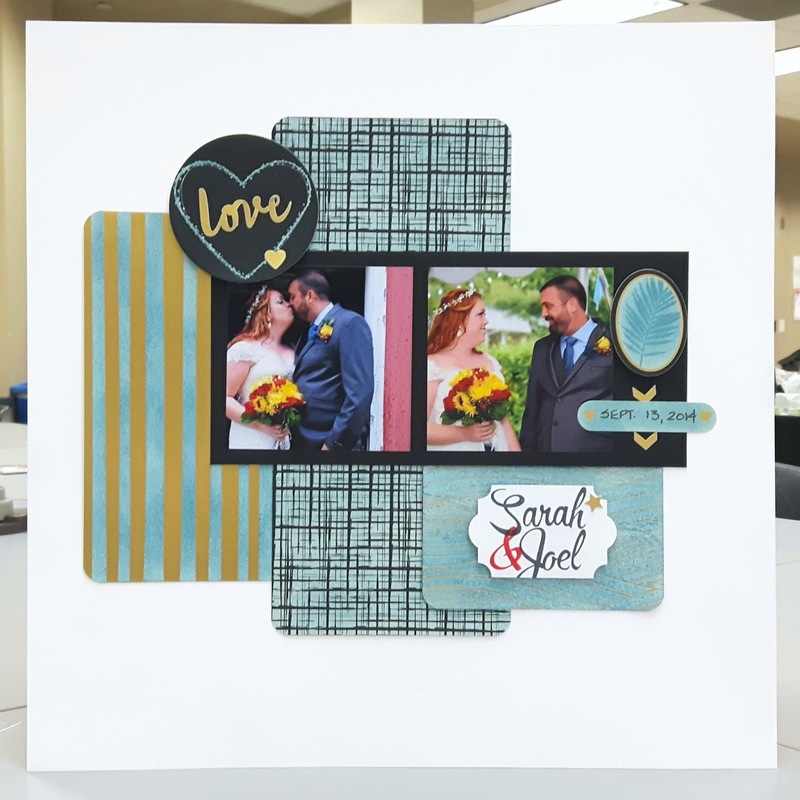 In this month's grab bag was the Bundle With Love Memories & More card pack. For the two projects I designed for our make and takes there is no stamping! The cards and stickers included in the card pack make this projects easy and quick! The blue elephant image on the bottom right pocket is punched from one of the 3x4 cards. This card pack has blue on one side and pink on the other! So the above pocket page can easily be created for a girl instead! The box below was created using the envelope punch board and instructions were from another demonstrator: Sam Hammond Donald from the UK. We used the beautiful, thick designer series paper that was a Sale-A-Bration item this year. It was the perfect weight for the box but it was a little hard to score properly. Lisa created the card and 12x12 scrapbook page. Love her card! The patterned paper is one of the 4x6 cards cut down and them stamped with the leaf. 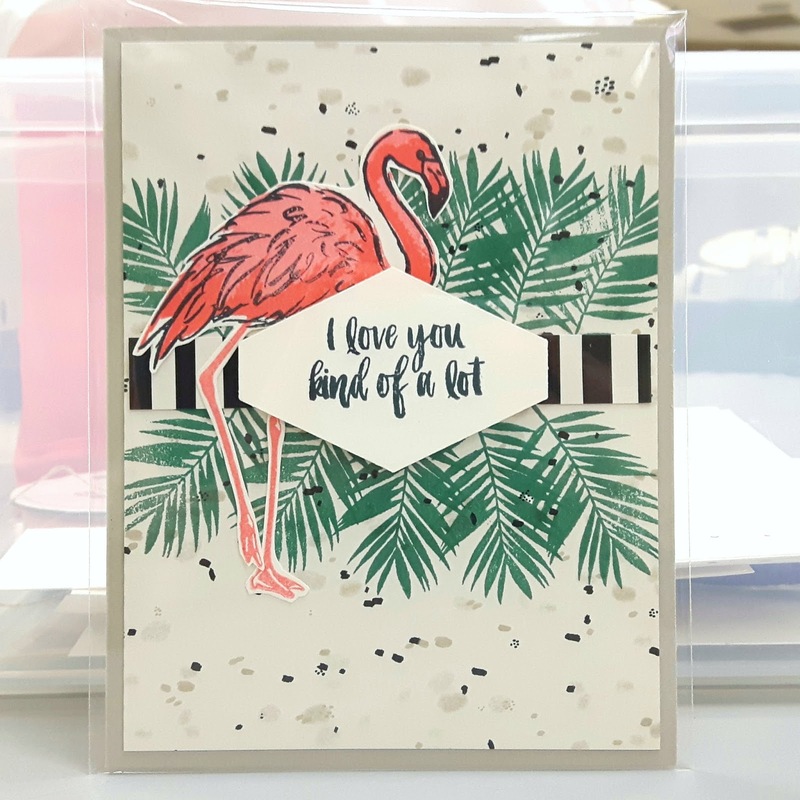 She finished off the card with the flamingo, a strip of paper from another of the cards in the pack and a punched greeting. On her scrapbook page she changed the look of the cards by sponging the Very Vanilla with a blue ink. The Memories & More card packs are so versatile! May's crop is fast approaching! We will be celebrating International Scrapbooking Day (it is today, May 5th but we are still celebrating!) and it's in support of Relay for Life! Check out the details over on Facebook and we look forward to seeing you there. Deadline for registration is May 14th.